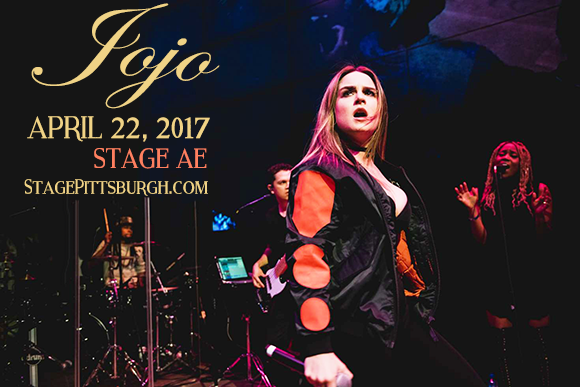 Jojo comes to Stage AE on Saturday 22nd April 2017! That's right Jojo fans get ready as the singer behind the sensational pop smash hits such as "Leave" "Too Little Too Late" and "No Appologies" takes to the stage this Spring! Her powerful melodies and emotive lyrics will be stronger than ever for her 'Mad Love' dates across North America… This night is bound to be a big one so be sure to book your tickets before it's too late! "Complete with full live band, JoJo took fans on a trip down memory lane, but it wasn’t just her music she used to help turn the clocks back. With nods to Soul II Soul, Toto, Phil Collins, and more, the now 25-year-old let it be known that she’s a student of the game. She does this music thing for real!"